Calling All Virginia-Highland History Buffs! The Virginia-Highland Civic Association Preservation & History Committee formed nearly two years ago and has made great progress. We’re inviting all lovers of history to play an important role: join our committee for starters, and become the History Champion of your subdivision. 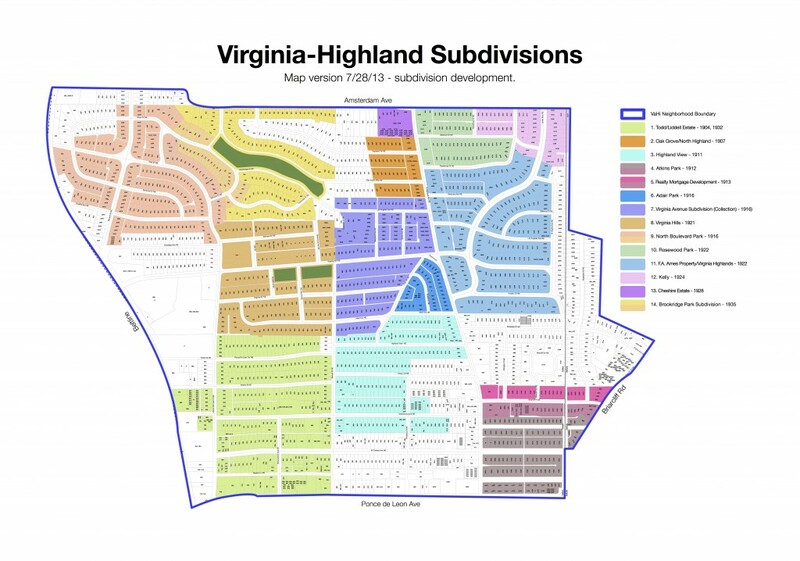 Virginia-Highland is actually made up of many subdivisions and was primarily developed from the early 1900’s through the late 40’s. The number of named subdivisions varies depending on which history you look at. The disparity is often a product of incomplete developments being absorbed (or expanding) into larger subdivisions. The map shown below gives a rough idea of the key historic subdivisions and the approximate dates of their development. We’d love for our Subdivision History Champions to help us uncover as much history as we can, subdivision by subdivision. We’ve learned a lot, but there is much more to know. We can advise you on the process, scanning specs and best places to look for historic information. The type of history you collect could depend on your own personal curiosity and where it leads you. Oral histories, images, and documents are productive starting points, as are identifying and protecting landmarks, and investigating subdivsion historic designation. The Preservation & History Committee can advise you in all these processes. Click on the map image above to view a larger version. Reach out to us directly at preservation@vahi.org. We’d love to get you involved! This entry was posted in news and tagged 2013, history, maps, preservation by John Becker. Bookmark the permalink.